Join Me at Mix & Match Design Company! Hello, friends! Today will be the last post on May Richer Fuller Be, but don't worry, I'm not going away. :) Since going full time with my e-design business this summer, I've devoted all of my time and energy to growing it, and I would love it if you joined me over at Mix & Match Design Company! I blog about all things interior design and decorating, and it's where client project reveals are too. Yesterday, I posted a great gift guide for your Thanksgiving Host/Hostess - this year, show your appreciation to them for opening their home by bringing something a little more creative than a bottle of wine (though that's always welcome in my book!). 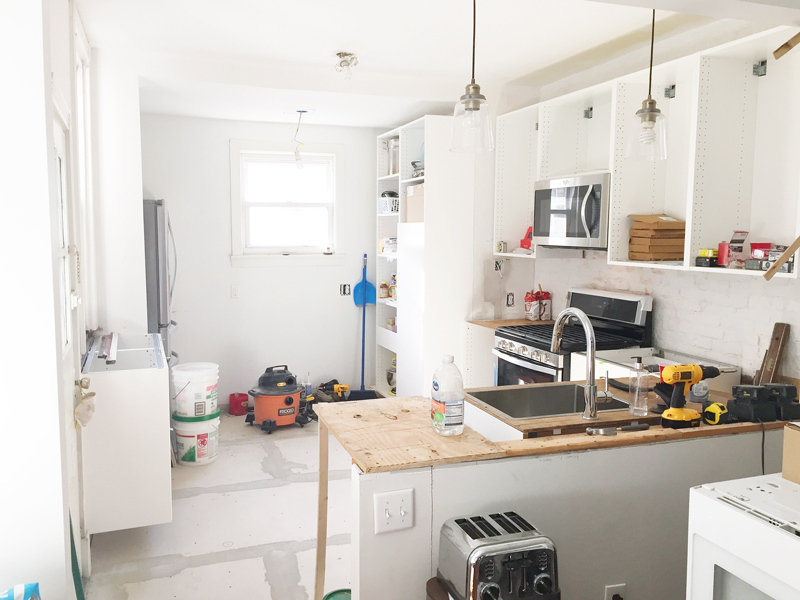 And if you've been waiting for the kitchen reveal, you're in luck, because it's over there in all its before and after glory! 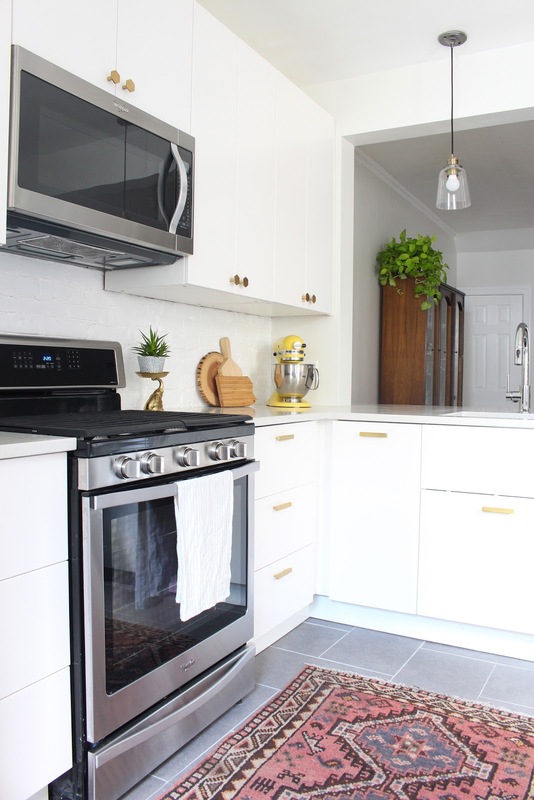 Our IKEA kitchen turned out even better than I could have imagined, and I'd love for you to pop over and see it. These past four years(!) at May Richer Fuller Be have been incredibly formative, and have given me the chance to grow in more ways than I can count. Writing here gave me the confidence to start my business, and it's been such a joy to pursue something that I love so much. Thank you for your support here - it means the world to me, and I do hope you'll follow along with Mix & Match! Thanks again, friends, and I hope to see you around the new blog and social media soon. Don't be shy in saying hello and letting me know you're coming over from MRFB! The winners, Erin and Ryan, submitted their dining room, which Erin described as "pretty much a blank canvas" that had a $100 table from Craigslist, a dated light fixture and a hodgepodge of other pieces they were ready to let go of so they could make the space into something they really enjoy. 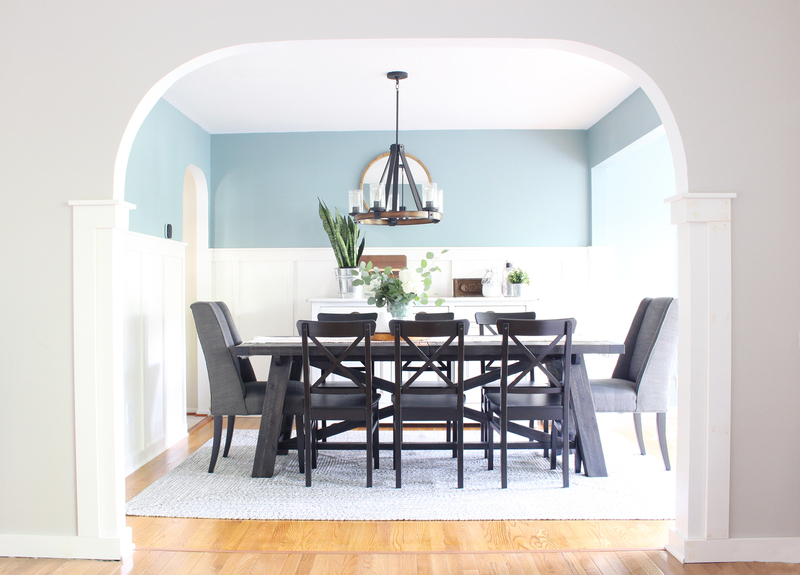 They love hosting friends for meals and large gatherings, so they couldn't wait for the room to be done. This was such a fun project, and I'm thrilled with how it turned out. 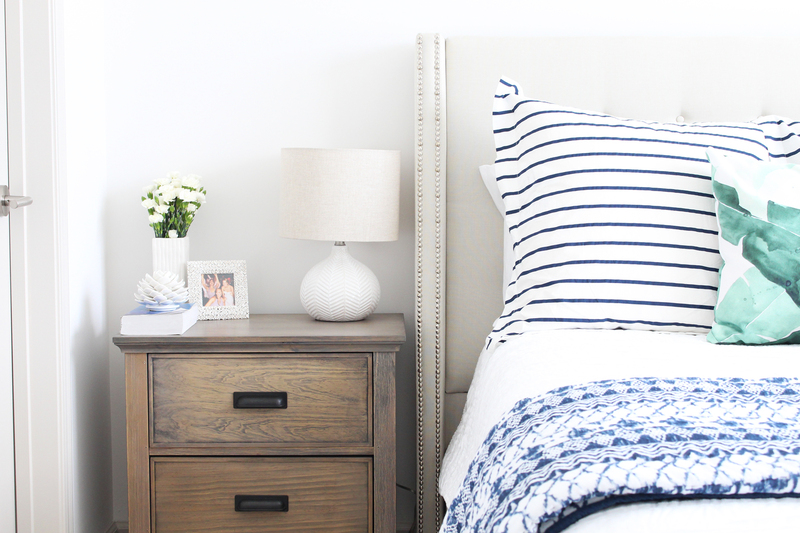 Head on over to the Mix & Match blog for all the details! 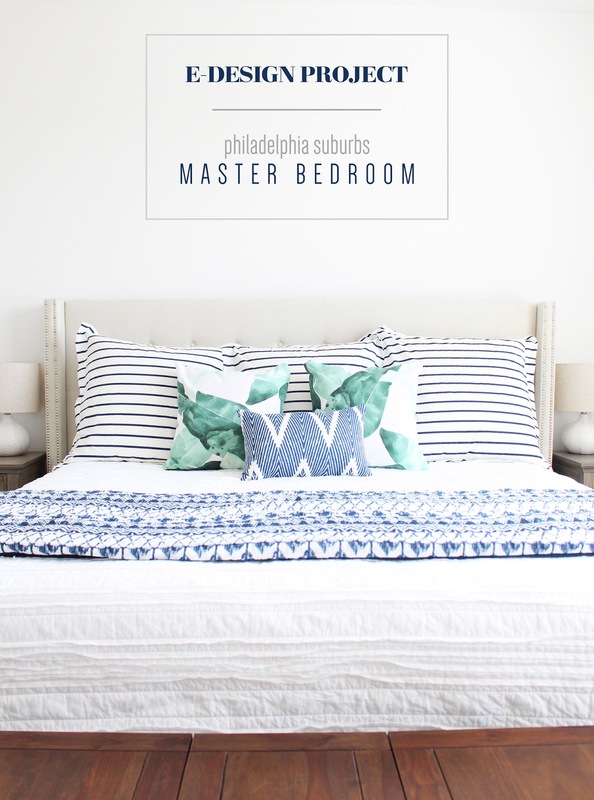 You may remember when I shared the design plan for this modern farmhouse master bedroom in the Philadelphia suburbs a few months ago and I'm excited to show it to you today in its completion! This project was a blast to pull together, and I was thrilled that it was local so I could go snap some photos on a beautiful Sunday afternoon a couple of weeks ago. 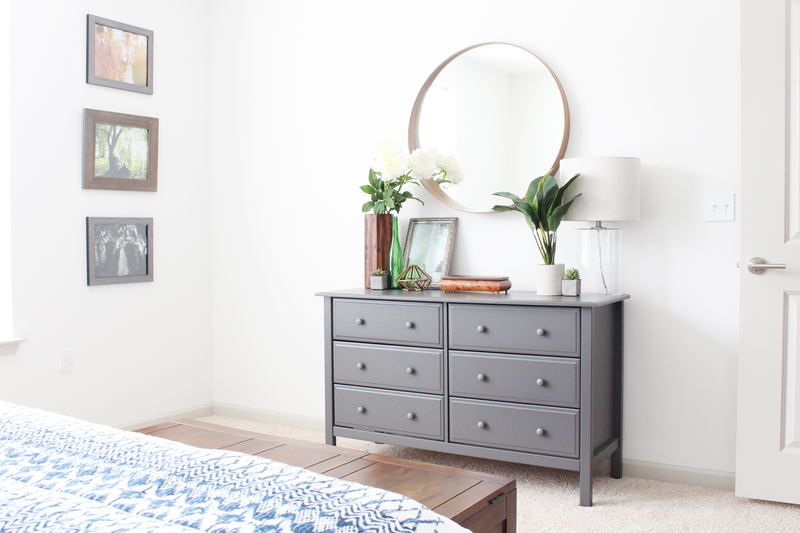 My clients, Courtney and Kit, were going through some big transitions this summer including a move from a tiny one bedroom apartment in the city to a two bedroom in the suburbs and both starting new jobs, so the last thing they wanted to do was figure out how to furnish their bedroom. 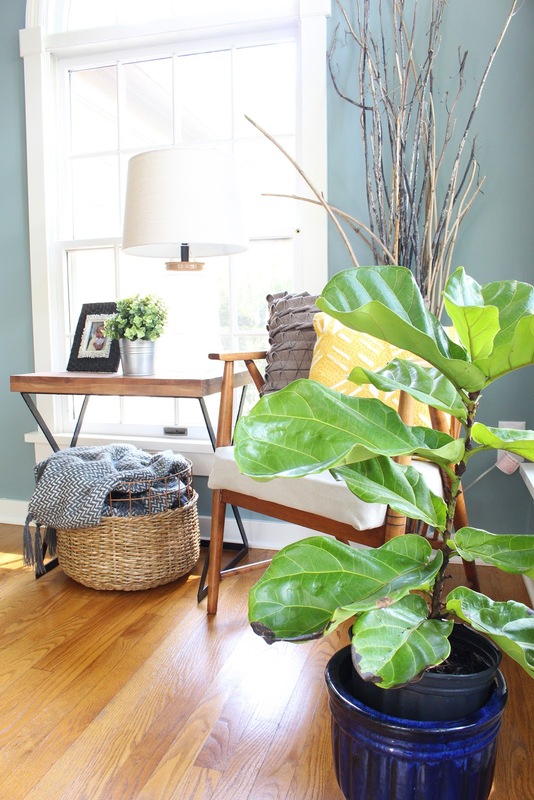 That's where Mix & Match stepped in to help - I created a design plan and then all they had to do was purchase the items and install them in their new home. And here's the finished room! To see more photos and read more about the process, head on over to the Mix & Match blog. That's where I'll be sharing full e-design project reveals and more. 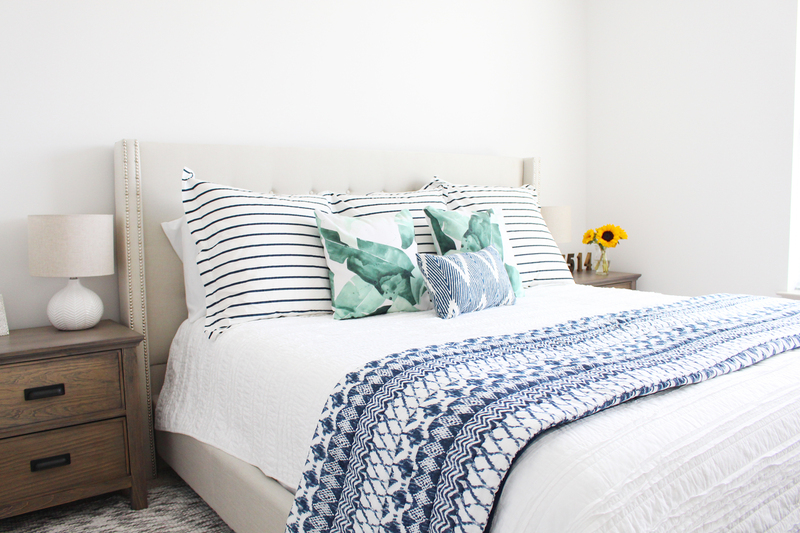 You can also follow Mix & Match on Instagram in between posts for more design goodness! If you or someone you know needs interior design help in their home - whether a big project or small - feel free to contact me. I'd love to help! The long-awaited kitchen update is here! If you've been following on Instagram (@mayricherfullerbe), you've seen some sneak peeks here and there on our progress, but it's high time for a full blown post on it. 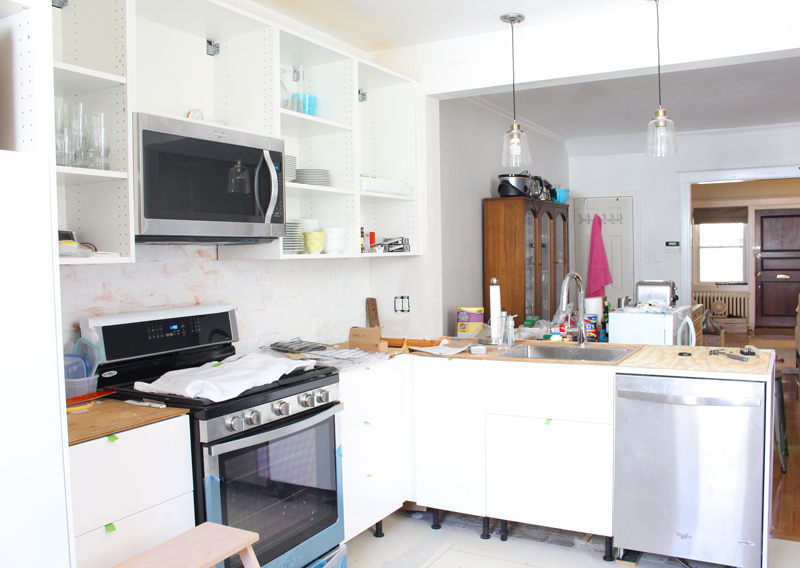 I wanted to share about it in real time, but quickly discovered it was almost impossible to take on a full kitchen reno and launch an interior design business at the same time (and still sleep!). 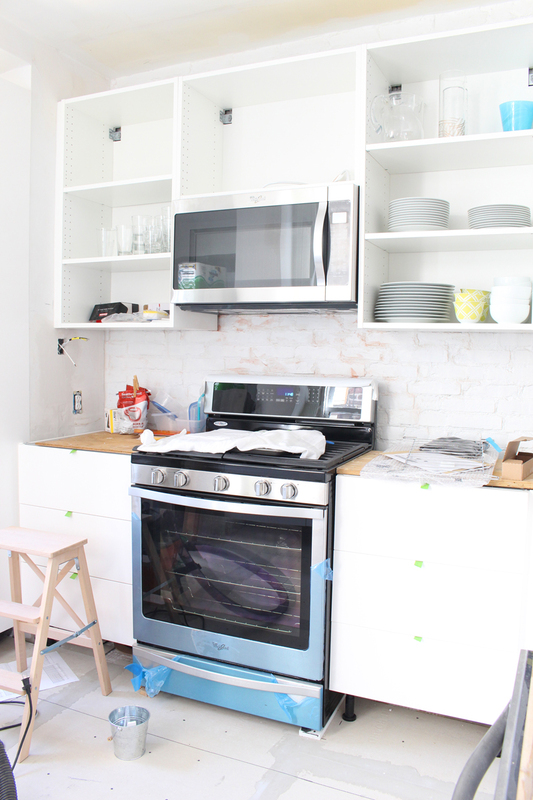 Now that we're mostly done with the kitchen, my time is a little less crunched, and that means I can update the blog! 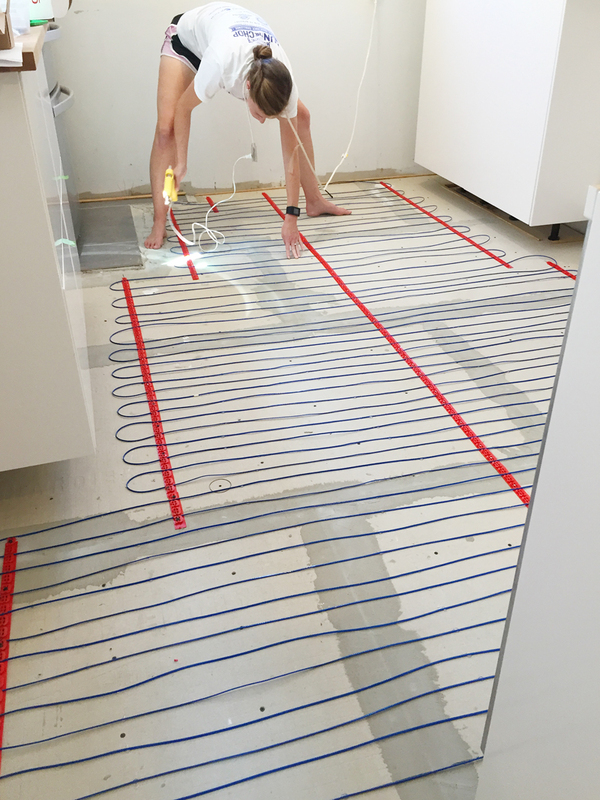 Last time I wrote about the kitchen, I shared the design board and plans, but as a quick catch up, here's a little about where we're headed - we're doing a modern white IKEA kitchen with quartz countertops, brass hardware and charcoal tile floors. It's a complete cosmetic gut job. There are no structural or plumbing changes, but everything else is OUT. I'm going to break this reno up into several posts starting with the demolition and the beginning of putting it back together. It felt like it took forever, but all in all, it only took three weeks to get the major work done thanks to the amazing contracting by my father-in-law. This was his last job before retirement, and man, we worked him hard and we're so so grateful for his work! The main wall of cabinets had exposed brick behind it, which is pretty sweet, but it was looking totally disgusting from years of grease buildup. After a little bit of deliberation, we decided to simply clean it up and paint it glossy white to match the rest of the trim in the house. 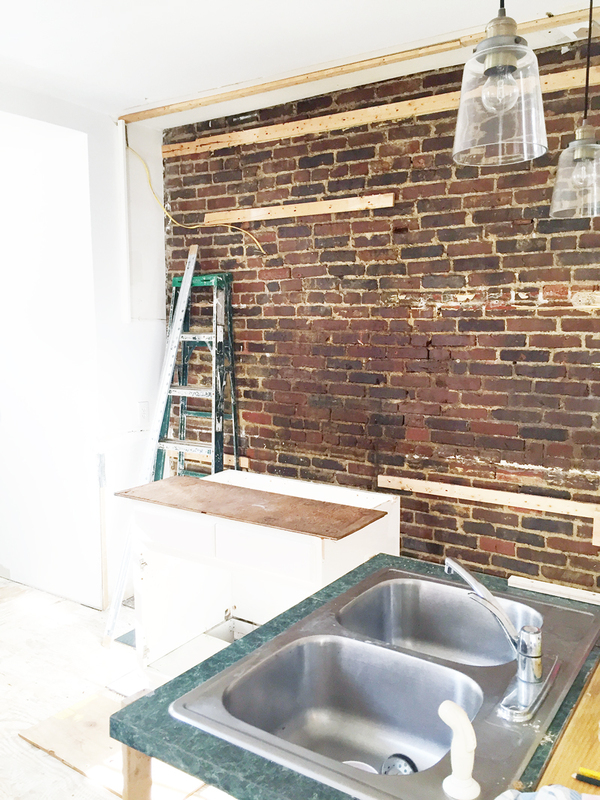 It looks like a rustic subway tile now and I love it (photos to come on that!). Next to go was the old tile. The floors were pretty uneven, so a lot of the tiles were cracked and some had been replaced over the years with non-matching tiles. 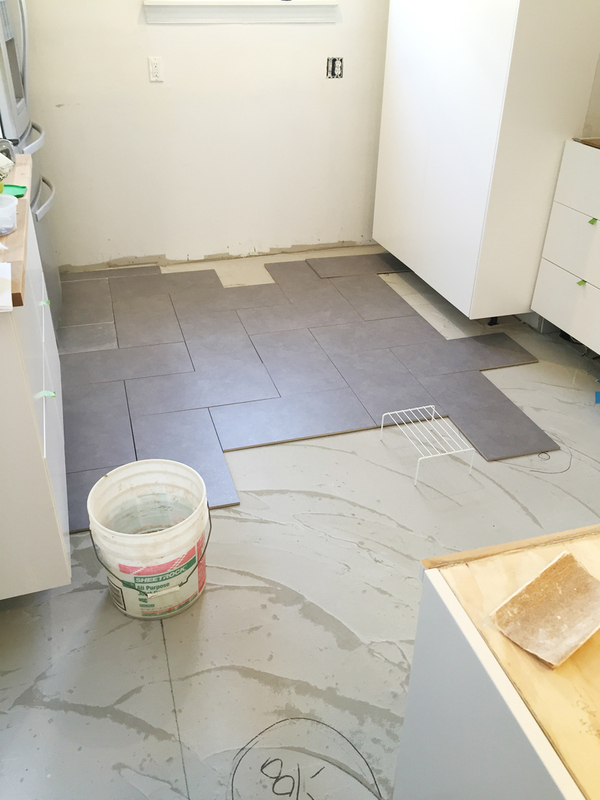 My father-in-law spent a lot of time scheming and figuring out how to make the floors dead flat so the new floors won't have a tile cracking problem in the future. 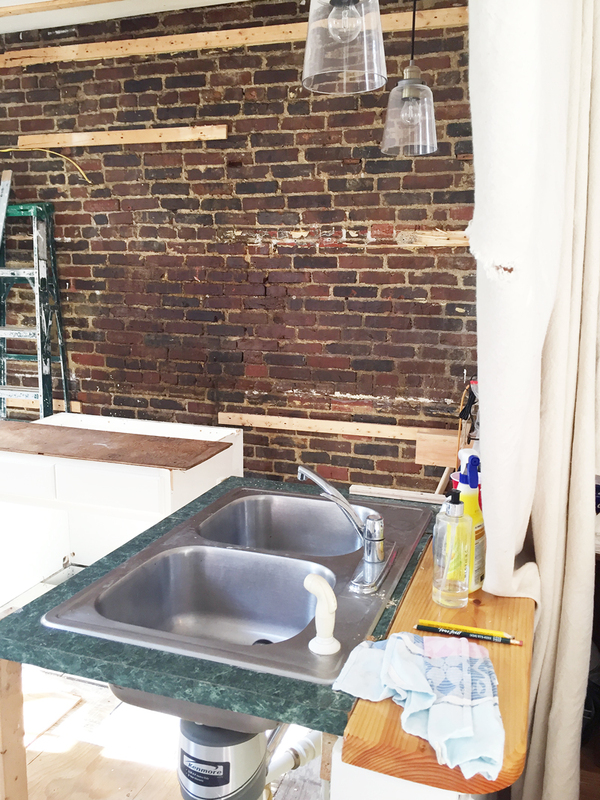 One little fun fact - we only went without a sink for two days during this who renovation. It was amazing! 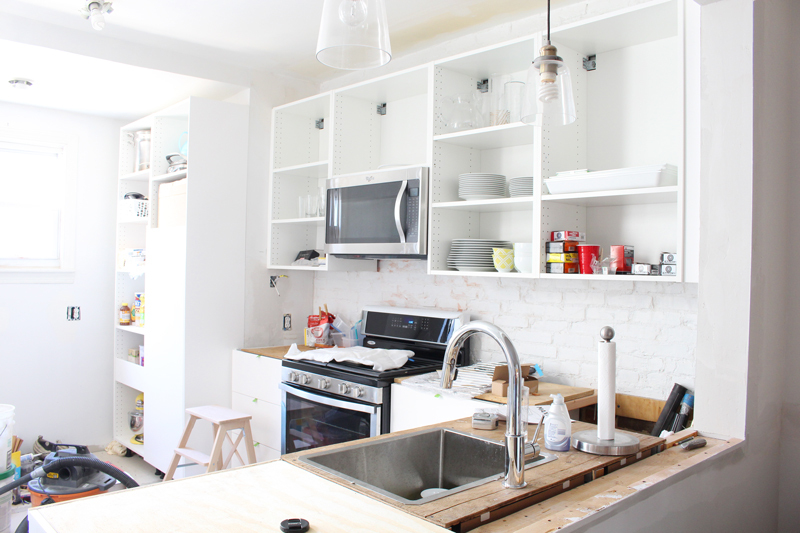 We waited until the very last minute to swap out the old one with the new sink and sink cabinet, so those of you who are going through or are planning a kitchen renovation, see if your contractor will work with you to do this. It makes living in a construction zone so much less bad. 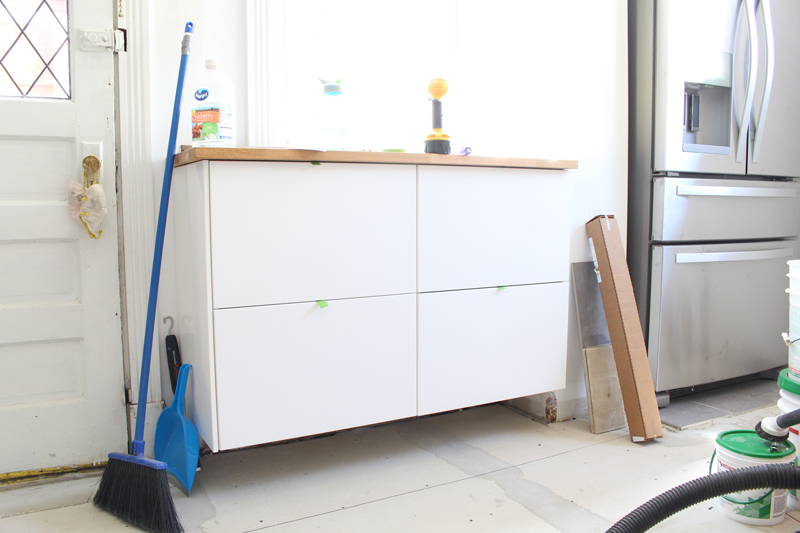 After everything was disassembled and cleaned up, we started installing the new IKEA cabinets! I spent many, many hours assembling them while my father-in-law did the skilled labor in the kitchen, but it really wasn't so bad. 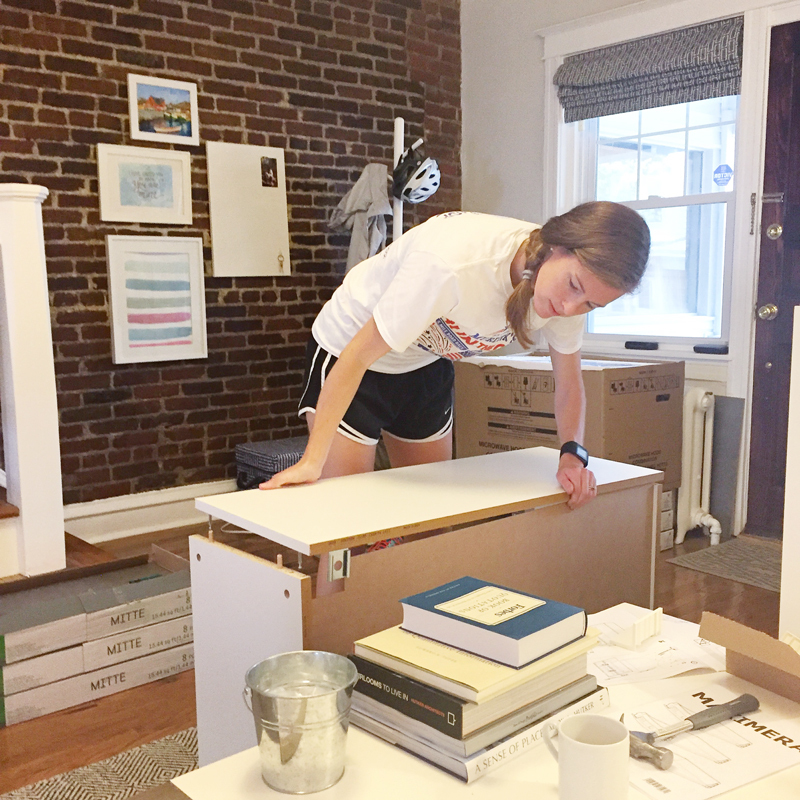 I had 13 cabinets and 17 drawers to assemble and let me tell you, IKEA has an incredible system that just works. It's pretty difficult to mess up if you follow the directions. And though it's time-consuming, if you break it up over the course of a week or so it doesn't feel totally overwhelming. Here's an awkward picture of me putting one together. You're welcome. Ahh! New cabinets! 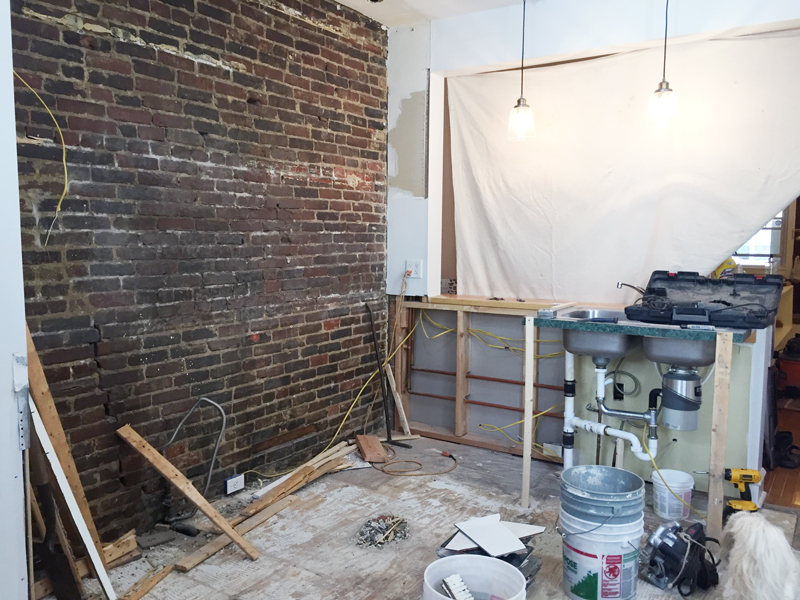 It's starting to look like a kitchen again, right? 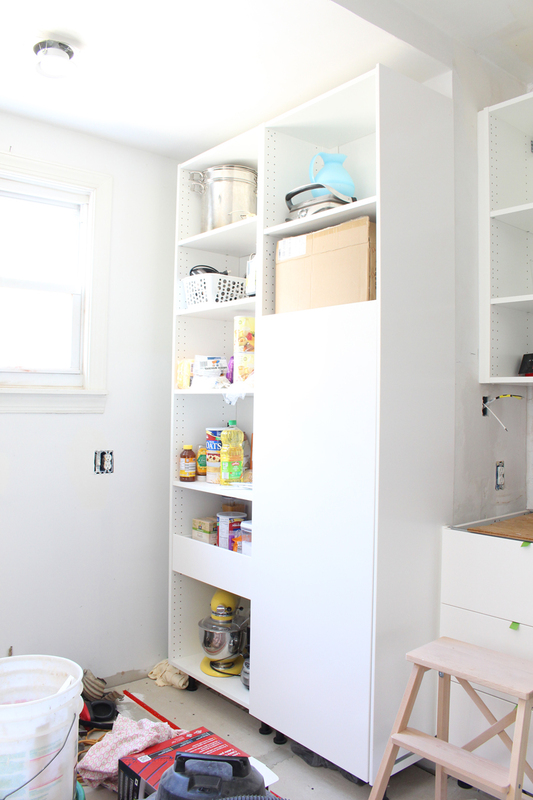 These two tall pantries are amazing. We put a lot of shelves and a few drawers in them and they're perfect for dry goods, small appliances and our coffee station (more on that soon...). These are helping us keep our countertops clear, which was one request from my husband, and he doesn't request much, so you know I had to make that a priority, right? 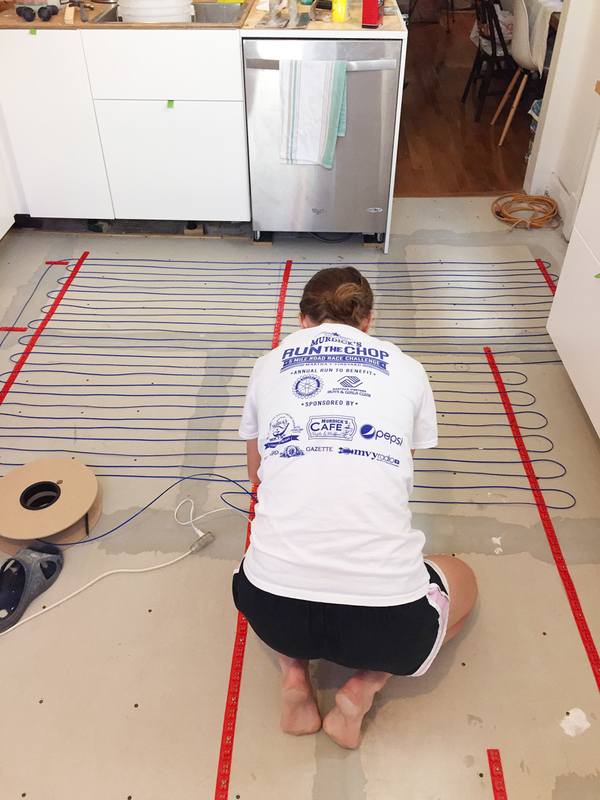 Once all the cabinetry was set, it was time to take on the radiant heat flooring project. This was on my dream wish list and I'm SO happy we decided to do it. Our kitchen gets ridiculously cold in the winter because it hangs over our garage and the outside world. 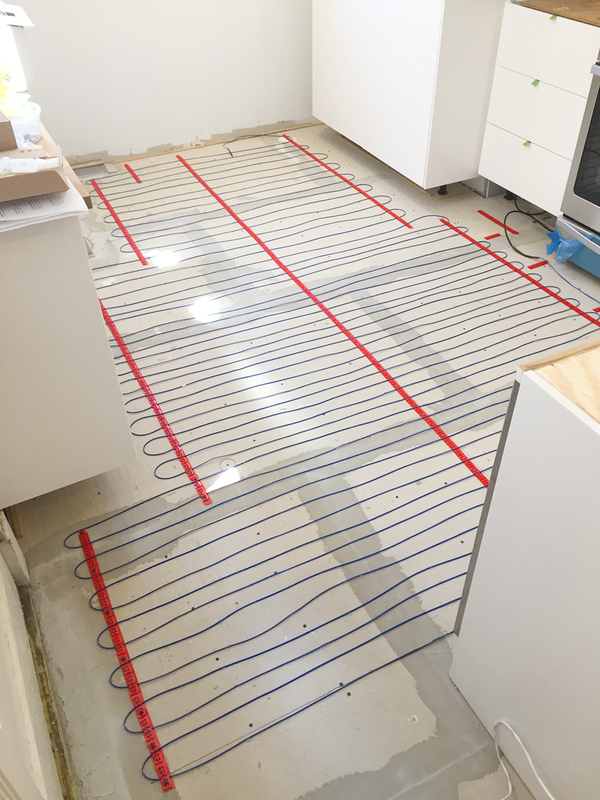 These radiant heat floors will make a huge difference. We went with a loose coil system from Warmup (best customer service ever, by the way. I can't speak highly enough of them - and no, they're not sponsoring this post!). You basically nail down these guides and then weave the wire through them, keeping the wire at least two inches apart throughout. You also want to make sure you keep the wires out from under appliances and cabinets. Here's another fantastic picture of me for your viewing pleasure. I'm adding some hot glue to places where the wire wanted to stand up. This helps keep them from popping up when you're pouring thinset onto the system. And no, I didn't do this by myself - my father in law gets most of the credit for making this dream happen! After a layer of thinset dries on top of the wires, it's time to tile! 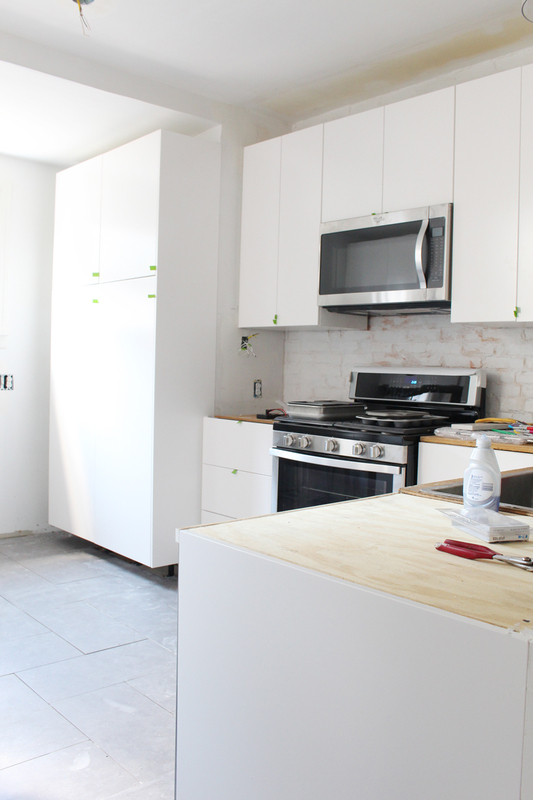 Once the tiling was complete, we were done with the major stuff - minus the countertop installation - big high five! This little bank of cabinets on the opposite side is probably my favorite new addition. It's kind of like a floating sideboard. We put butcher block on it for a countertop and I love the warmth it brings to the kitchen. Those deep drawers are awesome for storage too! You can also catch a glimpse of the fancy new fridge. Can't wait to share details on that soon! So that's where I'll wrap up for today. I think that's enough to take in for one day! 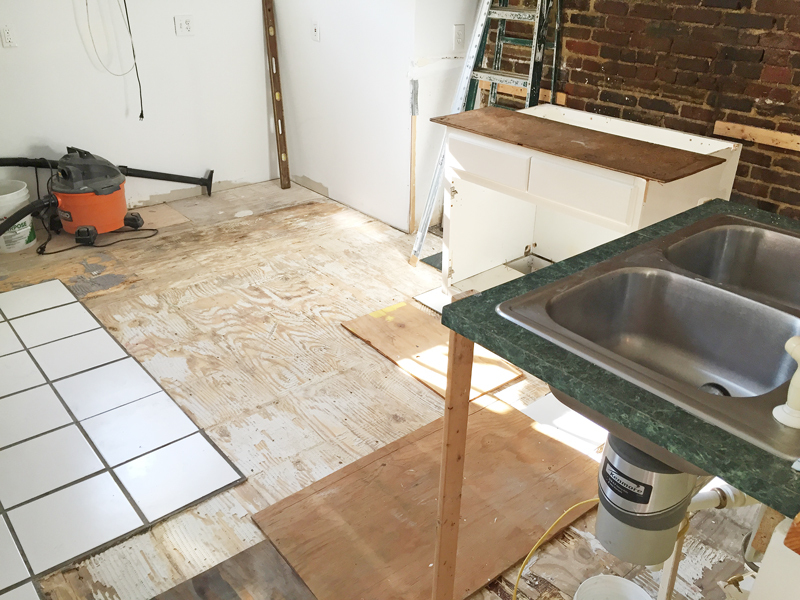 Our countertops were install this week, so it's looking even better now. There's some finishing work to be done including painting, caulking and installing knobs and pulls, but we're thrilled with how it has turned out so far! 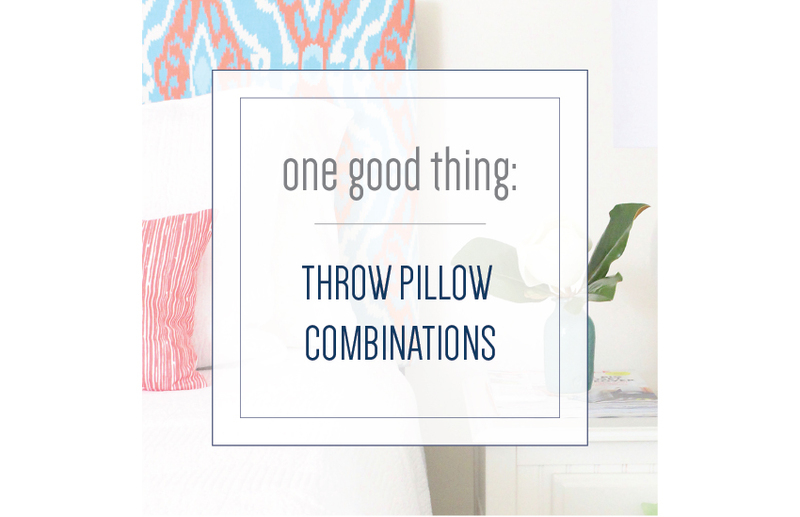 A new series started this week over on the Mix & Match (my e-design biz) website's blog called "One Good Thing" where I share a favorite quick design tip or trick. 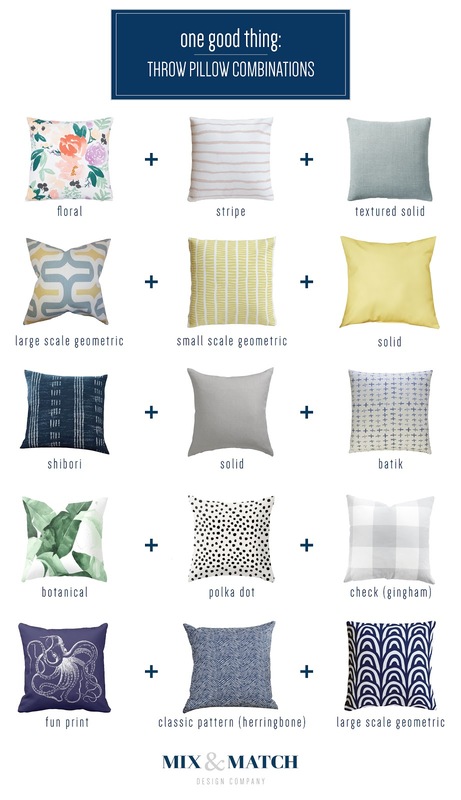 I figured a lot of y'all over here might appreciate the post since this week's topic helps solve a common decorating conundrum: how to mix throw pillow patterns so they look cohesive. I put together five super combos to help show you how to mix patterns. 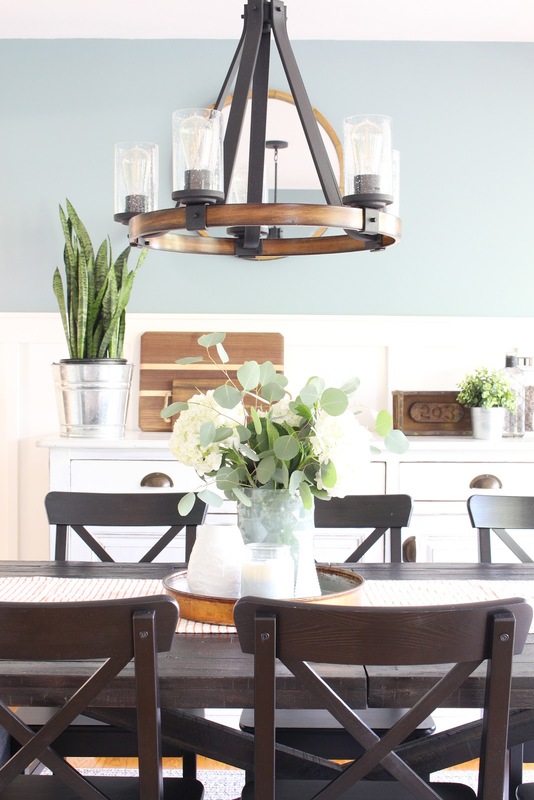 You'll have to head on over to Mix & Match to see the full post, but you can check out a preview of the combos below! I've got lots of ideas up my sleeve for other posts in the "One Good Thing" series, but if you have any suggestions, I'm all ears! 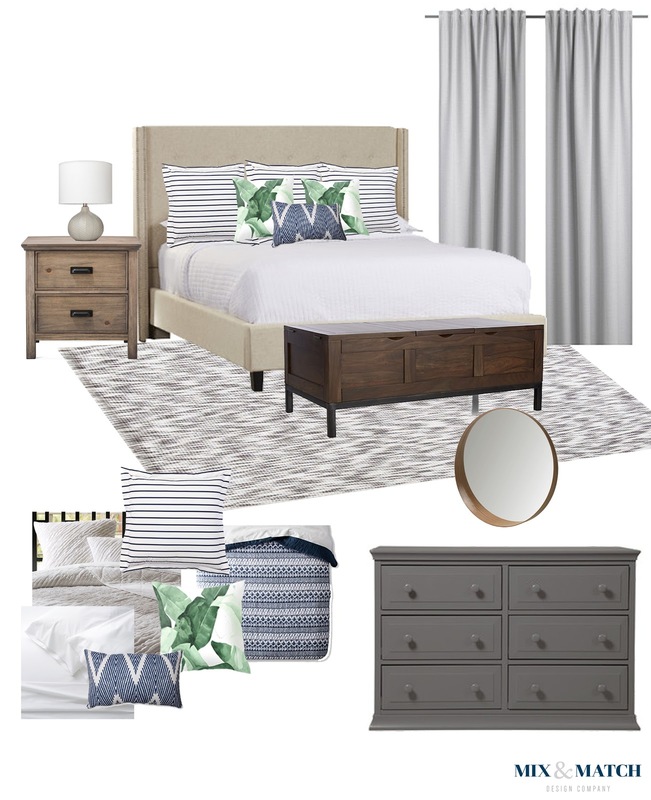 Feel free to leave a comment on the Mix & Match post or email me at chaney@mixandmatchdesign.com.